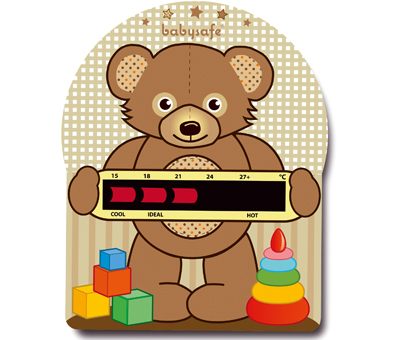 Babysafe® Temperature Indicators for Child & Baby Safety. 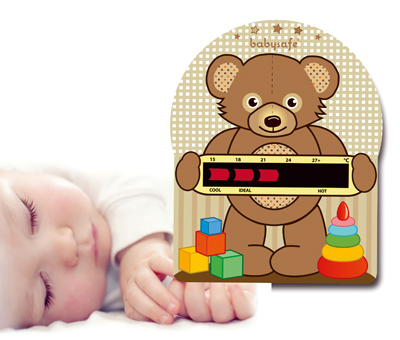 LCR Hallcrest manufacture a wide range of child and baby safety thermometers and temperature indicators, combining technological innovation with accuracy and child friendly designs. Our products aim to provide added safety and reassurance to parents and carers, from the time a baby is born and through their early years. 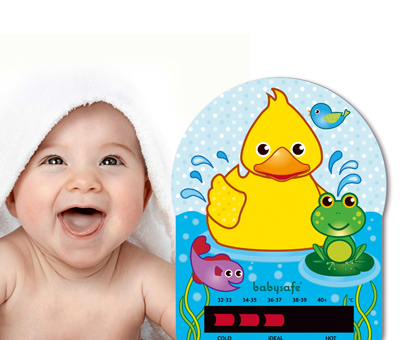 Our colour changing safety products help to ensure a childsafe environment. 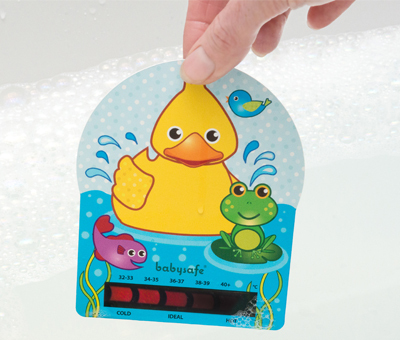 Our products are manufactured in the UK, are long lasting, easy to use and completely safe. Liquid crystal thermometers are particularly suited to childcare. We have a range of stock products available, and can also produce any new design or shape to your artwork. 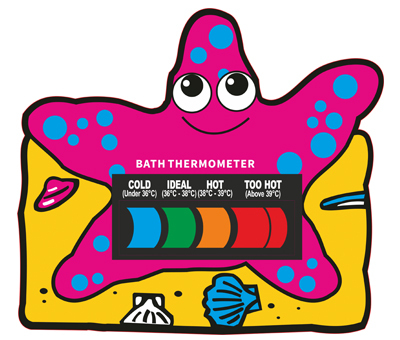 Don’t just stick your elbow in – now a range of thermometers is available that are quick and easy to use, and in attractive designs and shapes. 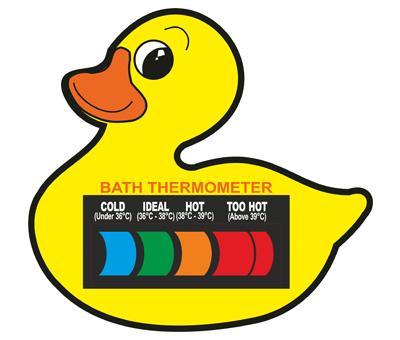 Simply dip the thermometer into the bath water once it is run. The safe unbreakable liquid crystal thermometer spans temperatures from 25°C to 60°C, and shows when the water temperature is too hot or cold. A tick appears when the water is just the right temperature. 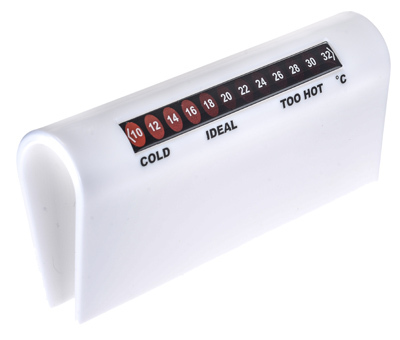 Additionally, check that your boiler hot water temperature is not too scalding hot by using an Anti-Scald Gauge.This is a temperature indicator which you put into hot water run from your hot tap. It will show if your hot water is within a safe temperature range, or too hot and potentially able to scald. It is important to ensure that your baby does not get too hot or too cold; to reduce the risk of cot death, tempertaure control while a baby is sleeping is particularly important. 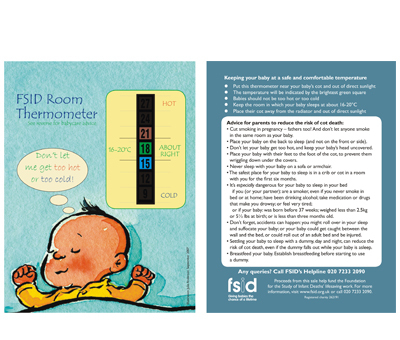 The ideal room temperature for a baby is 16° to 20°C, and a liquid crystal room thermometer provides a safe accurate way to monitor a baby’s room temperature. Our room thermometers are large, easily visible and quick to read. They also carry a list of useful safety advice about reducing the risk of cot death, and caring for your baby. 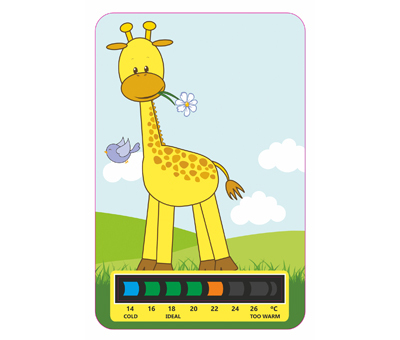 Available with °C or °F thermometers, on a laminated board backing. 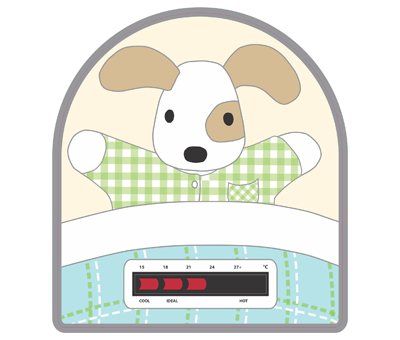 The new Sleep Thermometer constantly monitors the temperature beside your baby when sleeping. 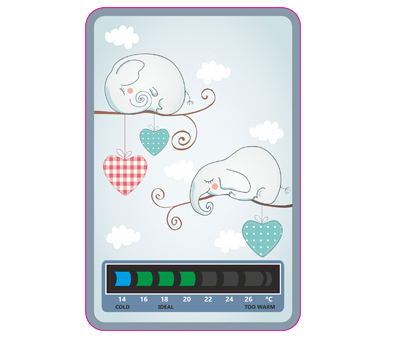 Our innovative babysafe® Sleep Thermometer has been designed to help ensure that new parents and their babies are offered the best opportunity of a safe start in life. 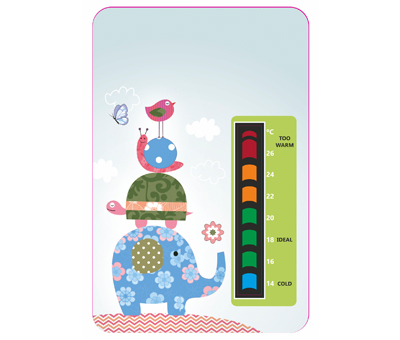 Simple safety temperature measurements are important, and give peace of mind to new parents and carers. 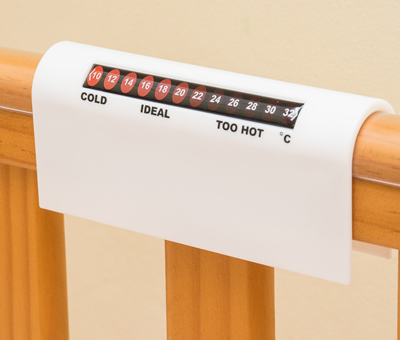 LCR Hallcrest’s unique Babysafe® bedroom thermometer clips easily to a cot rail, and is a world first in advanced British-made monitoring technology for the safety of babies. It has been developed with the latest generation liquid crystal temperature reactive technology, and has been designed to display an accurate safe temperature, or to warn if the room becomes too hot, night or day. 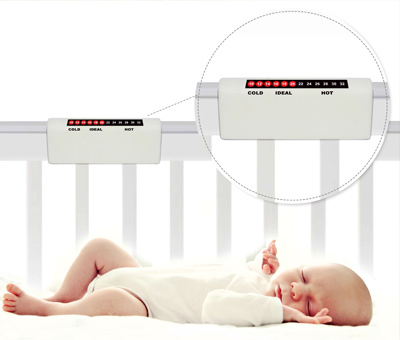 An integral red LCD moving line, which moves clearly and visibly along a scale, allows temperatures to be quickly and easily monitored by a parent. 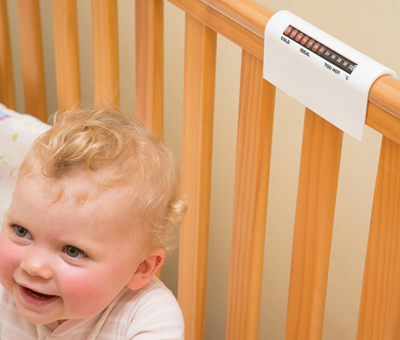 The Sleep thermometer has been cleverly designed to sit as close to a sleeping baby as possible in order to accurately monitor safe sleeping temperatures. Temperature has been recognised as a contributory factor in the occurrence of ‘cot death’ and it is important that babies do not get too hot, or indeed too cold. The ideal room temperature is 16°C-20°C. 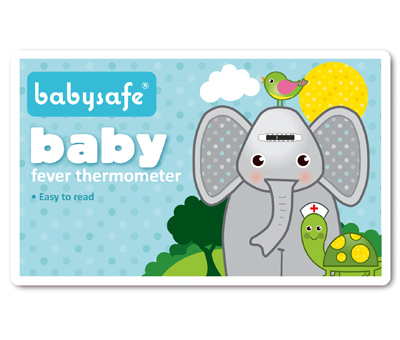 This new Babysafe® thermometer requires no batteries or mains power, and is covered by a patent application. 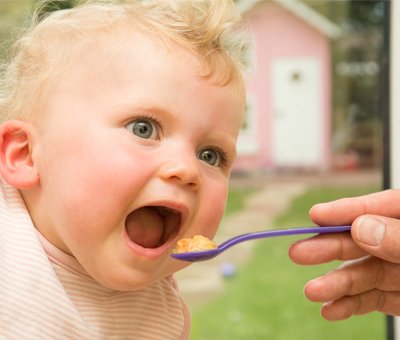 Feeding can be a time of anxiety for new parents and carers, trying to ensure that food is the right temperature, and not too hot to scald a baby´s mouth. Baby meals are often heated using boiling water or a microwave, and overheating or hot spots is a common problem. 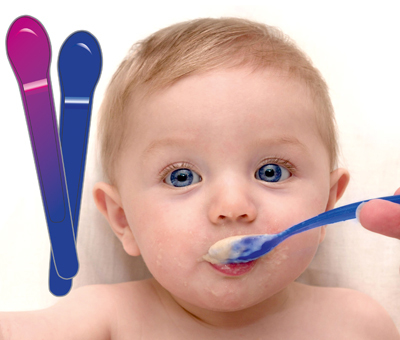 Using the unique Safety Feeding Spoon will show you at a glance if the temperature is too hot to safely feed a baby. 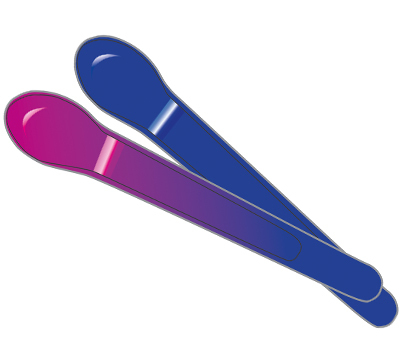 The spoon is designed to change from blue to bright pink if the temperature becomes too hot. The spoons are reusable, washable and unbreakable. A fridge should be set at 5°C or below, but many fridges are set too warm, particularly in summer. 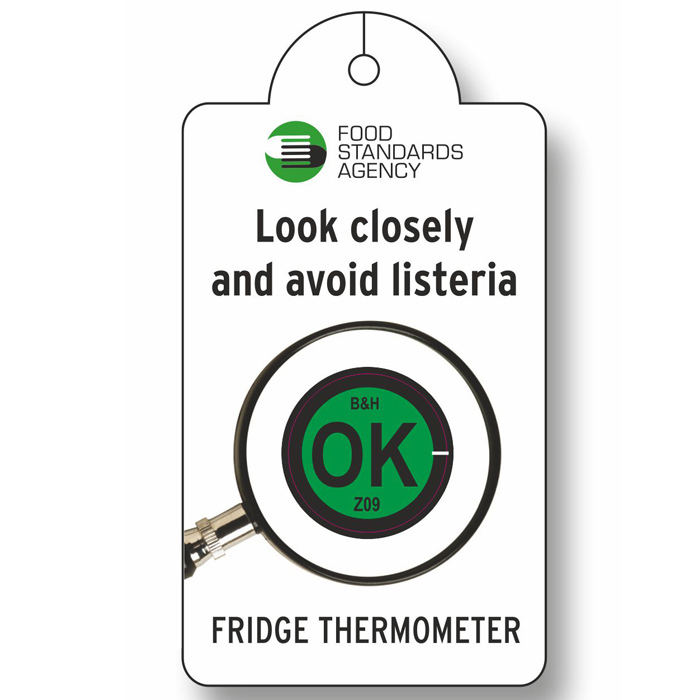 Ensure baby foods and milk are stored safely at a chilled temperature by checking and using a fridge thermometer. 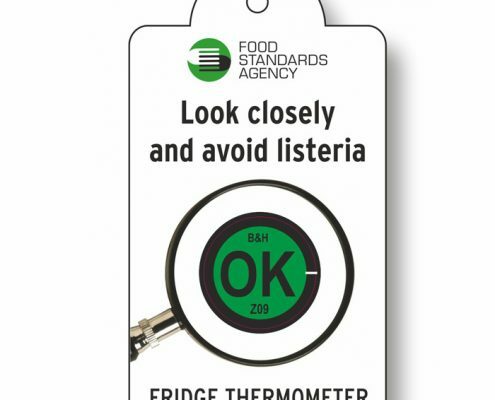 These liquid crystal fridge thermometers are unbreakable and easy to read. A Feeding bottle thermometer ensures a safe and comfortable feeding temperature for your baby, which should be around 37°C. In addition to our standard forehead thermometers we also have our new ‘moving line’ thermometer (L320-100), which moves along the scale to show detailed temperature readings in both °C and °F with a moving yellow line, this technology is now used to monitor temperatures in hospital operating theatres. Place on the forehead in the usual way and read the temperature. 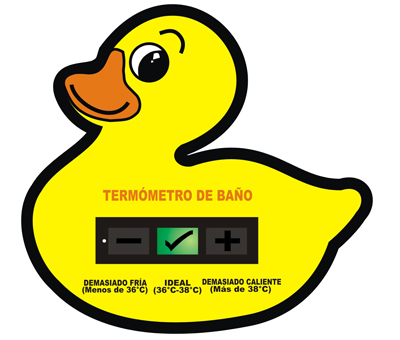 The centre of the yellow line indicates the correct temperature. Our stock products are available from 250 pieces minimum, with or without your logo printed onto them (go to www.tlc-line.com). Or we can manufacture your design or shape from 5000 pieces minimum. 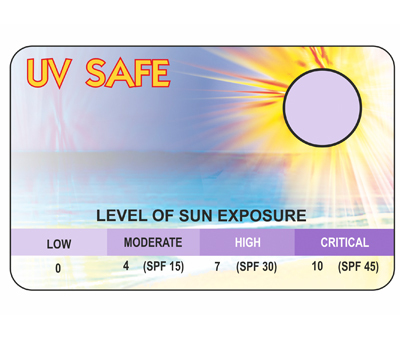 Ultra violet from the sun and its damaging effects are now an increasing concern for all. No one is more at risk than children. Even one serious sunburn experienced by a child can create the risk of skin cancer later in life, uv rays penetrate through cloud with just as much potential to burn skin. At higher altitudes or beside water, the effects of uv rays are much increased. 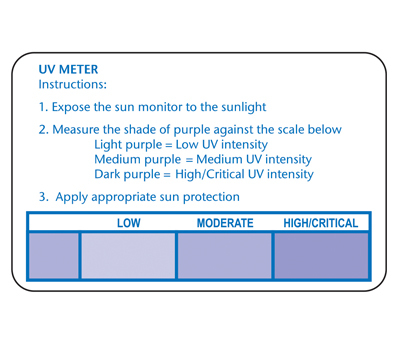 Having a uv indicator is a good reminder to check uv, and a sensible addition to any summer’s day. 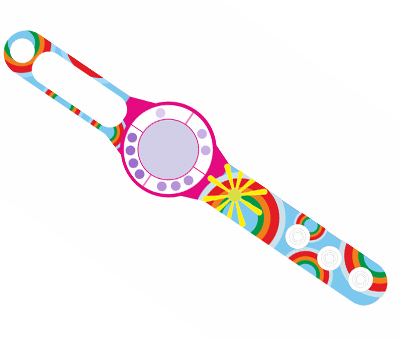 The UV card and UV watch indicates the level of uv exposure and provides a simple way to check this. A UV sensitive area on each will change colour becoming darker as UV levels increase.